This large, Gothic "Commissioners" church, built in 1824 to replace the old St John's Chapel (which see here), enjoys a commanding position at the junction of three roads in Belper. Belper has had a place of worship since about 1250; a chapel-of-ease was built above the Butts and dedicated originally to St Thomas Becket. The dedication was subsequently changed to St John. From that time until the early 19th century Belper was a part of Duffield Parish, and Belper folk would have walked to Duffield Parish Church for all major events. The fledgling Industrial Revolution brought about drastic changes in population centres and the mills at Belper attracted many families. Things really began to settle down to steady population growth following the victory of the Duke of Wellington at the battle of Waterloo in 1815: stability generally attracts investment. It was clear that a major re-assessment of the parish system was called for. England was no longer principally an agrarian economy centred on the old parishes such as Duffield. The growing towns needed better spiritual and practical care. Parliament granted £1,000,000 for the erection of new churches to be built throughout the land ‘as a symbol of a nation's gratitude to Almighty God for its safe deliverance’ (there almost certainly were some political motives as well!). Although St John's was licenced for weddings around this time it was clear that it was not sufficient: and so Belper was chosen early on as a beneficiary of Parliament's largess. The plans for a new church were prepared by Mr Matthew Habershon, and the contractor was Mr Spencer-Crewe. The foundation stone was laid by His Grace the Duke of Devonshire on 31 October 1822, and the church was opened two years later (1824), consecrated and dedicated to the honour and glory of God, and in memory of St Peter. 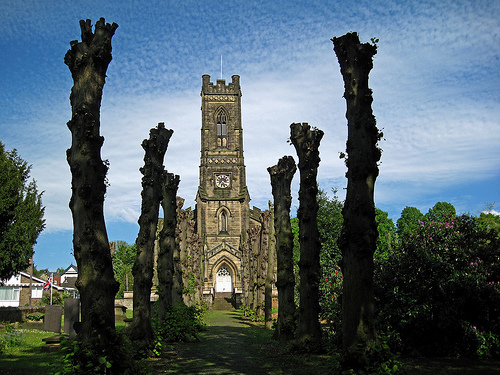 Churches built in this period are often referred to as ‘Waterloo’ or ‘Commissioners’ Churches. The church is constructed with ashlar masonry. It contains nave, chancel, north and south galleries, with a lofty tower, originally surmounted with pinnacles. The internal ordering is more reminiscent of a non-conformist chapel than a ‘traditional’ parish church: this reflects well the low-church theology of its conception. It seats 750 persons (less now than as originally constructed). 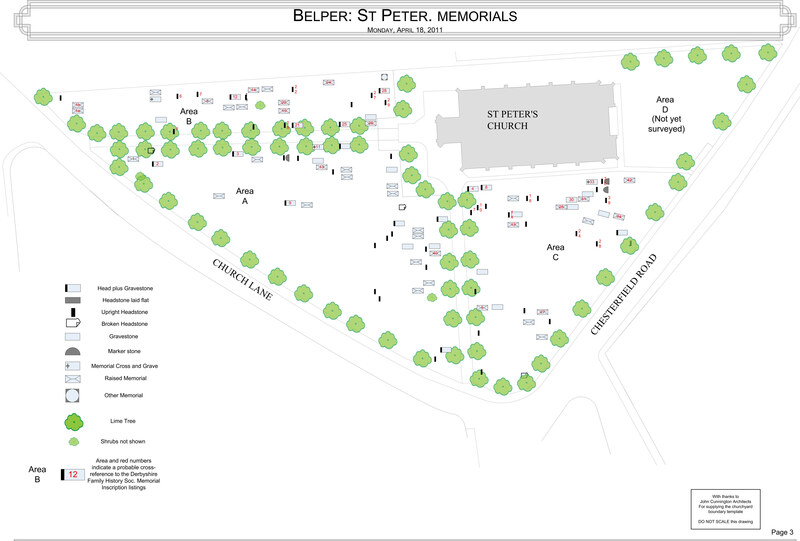 The graveyard was closed to further burials in the early 1950s, but a Garden of Remembrance to the east of the church is open for the burial of ashes (no memorials are permitted). St John's church was delared redundant in the 1970's and is now the Town's heritage centre and Town Council offices. Dimensions: length 101 feet, breadth 56 feet, height to ceiling 30 feet. The tower is 100 feet high and 20 feet wide at its base. There are eight bells, re-hung in the 1920’s. The organ was built by William Holt of Bradford in 1853; this replaced a seven stop organ that could have been by Snetzler. At the opening on December 22nd there was a ‘Full Cathedral’ service given by Leeds Parish Church choir. The organ was of two manuals costing 300 Guineas (£315). The case of the present organ is the original case although it was later extended backwards. In 1873 Radcliffe & Sagar enlarged the organ, providing a new console (still in use), increasing the swell organ from 42 to 54 notes and adding the Stop Diapason and Oboe. A four stop choir organ was also installed. In 1902 J.H.Adkins (Derby) carried out a mainly cosmetic ‘restoration’. Taken out of service in the 1930’s, the organ was restored and re-commissioned in 1978. There have been subsequent further modifications but the uniqueness of the original sound has been faithfully retained.